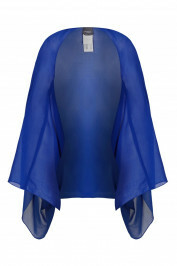 Introduce a touch of blue to your wardrobe with this stunning piece by Marina Rinaldi’s Persona. Elegant with a stunning tailored finish, this dress is just the thing to complete your smart look in style. Ideal for wearing with complimenting stole and a pair of heels. Blue tailored dress with optional sleeves. 98% Polyester, 2% Elastane. Fabric 2: 67% Acetate, 33% Polyester. Delicate Dry Clean only. Do Not Wash with Water.